I learnt about the K42 race after looking for some training events before the UMA in October. This race came up and with Kilian Jornet endorsing the front page of the website it seemed like a good race to get involved in. The first prize was also a free trip to Argentina for the event final and although this wasn't a goal for me it would be a great prize if I did manage to win! 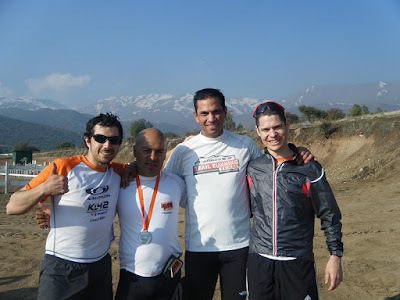 The day started off with some new friends picking us up and taking us to the venue just outside Santiago. It was up in the mountains with a great view of the back of Manquehue and some new trails I haven't run on before. I was expecting a tough race based on the race profile and it didn't disappoint. Ready for a few hours on the mountains. Through the first 10km I was running well in the lead group. We came into a section where the markings were not very clear and I went of course following another runner and splitting up the front pack. I was a little disappointed with the mistake as I had found a rhythm and felt comfortable in the group. When I rejoined the course we were amongst some runners on the 21km course so it was hard to tell what pace I should be running at and who would be turning off for the shorter race and who would be continuing. Fortunately at 15km the course split so everyone still running with me was in the K42. This was also the point where we started the 2,000m of climbing for the day. The climb was tough, muddy, snowy and beautiful all at the same time. There were spectacular vistas of Santiago and times when we were above the clouds. I felt ok in this phase of the race, overtaking a few people and not losing any places although I did have to walk significant sections of the uphill. I think my training prepared me well as I have been running and walking Manquehue often and that sort of pace is eaxactly what was needed. Unfortunately, I struggled a little with my shoes and feet. I developed some blisters under the ball of my foot which I think were caused by moisture and heat in my shoes. I was wearing the goretex version of Speedcross 2 that I used in Susitna and it was perhaps too warm a day for these shoes. I was slowed a little and felt uncomfortable for most of the rest of the race, but at least I learnt a lesson during a 42km race and not during the UMA. I made it to the highest point which seemed to come earlier in the race than I expected and started the race back down to the finish. The descent was fantastic and challenging and technical. We ran for about 10km down a dry river bed and it was definitely some of the longest sustained downhill running I've done. It was fun to be going down and I felt strong. The only factor that slowed me was blisters being aggravated by the additional friction in my shoes. I really enjoyed this section and would have loved to be running at 100% full speed with perfect feet. Working through some of the smaller hills close to the end. Happy to be at the finish! The final section was about 7km or 8km relatively flat into the finish. It seemed quite difficult at the time and I think I was right on the edge of my fueling and running low on reserves. Another lesson to be learnt and something I'll need to be more careful about in longer races. I rolled into the finish and was quite happy with how the race turned out. 5th place was a great result and I still have lots of improvement opportunities available for me to move higher up in the results. With new amigos: Jaime, Mauricio and Daniel at the end. I had an amazing day on the trails and really enjoyed myself in the mountains. The K42 was definitely one of the most beautiful and tough runs that I've done in Chile so far. I'll be back next year and stronger for the climbs!